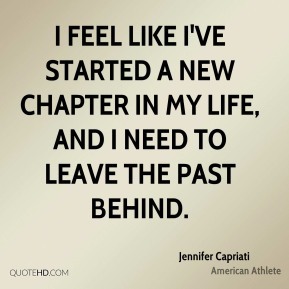 I feel like I've started a new chapter in my life, and I need to leave the past behind. 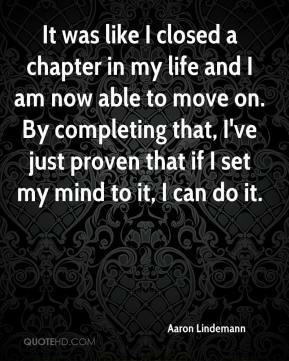 It was like I closed a chapter in my life and I am now able to move on. By completing that, I've just proven that if I set my mind to it, I can do it. 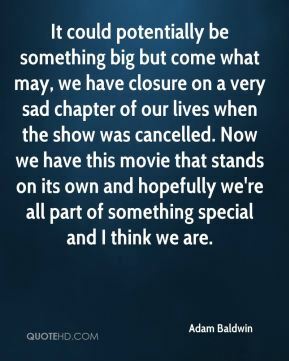 It could potentially be something big but come what may, we have closure on a very sad chapter of our lives when the show was cancelled. Now we have this movie that stands on its own and hopefully we're all part of something special and I think we are. 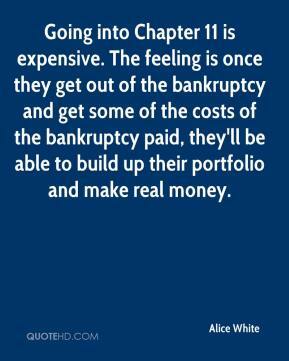 Going into Chapter 11 is expensive. The feeling is once they get out of the bankruptcy and get some of the costs of the bankruptcy paid, they'll be able to build up their portfolio and make real money. [A: At this point, it is another chapter of bad news on top of other bad news.] 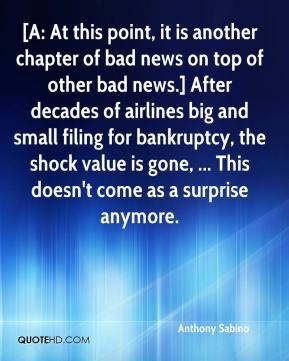 After decades of airlines big and small filing for bankruptcy, the shock value is gone, ... This doesn't come as a surprise anymore. The airline industry has a horrendous history in Chapter 11. 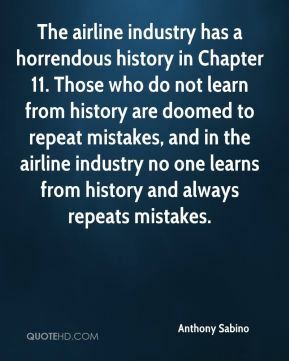 Those who do not learn from history are doomed to repeat mistakes, and in the airline industry no one learns from history and always repeats mistakes. It's over now, and we can try to move on to another chapter of our lives. It's one step at a time. 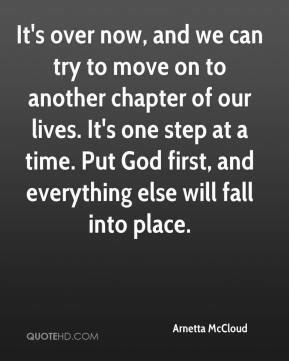 Put God first, and everything else will fall into place. 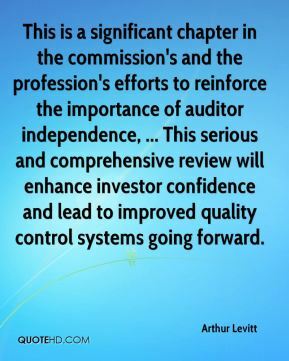 This is a significant chapter in the commission's and the profession's efforts to reinforce the importance of auditor independence, ... This serious and comprehensive review will enhance investor confidence and lead to improved quality control systems going forward. We hope that the efforts with Pakistan will be the beginning of a new chapter, ... 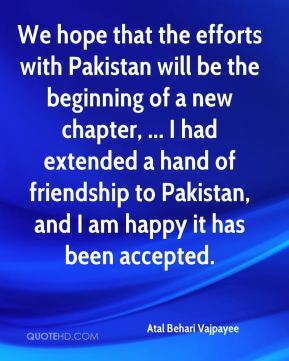 I had extended a hand of friendship to Pakistan, and I am happy it has been accepted. We're filing a constitutional challenge to NAFTA. 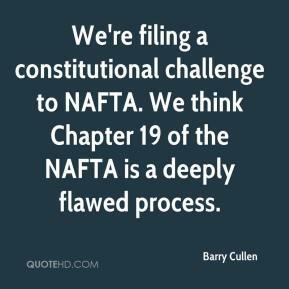 We think Chapter 19 of the NAFTA is a deeply flawed process. 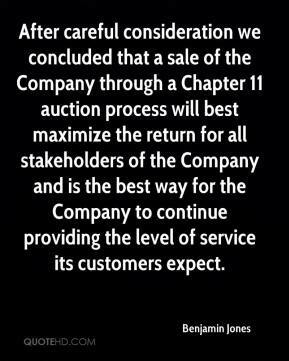 After careful consideration we concluded that a sale of the Company through a Chapter 11 auction process will best maximize the return for all stakeholders of the Company and is the best way for the Company to continue providing the level of service its customers expect. This is the next chapter in space after a long period of Cold War. 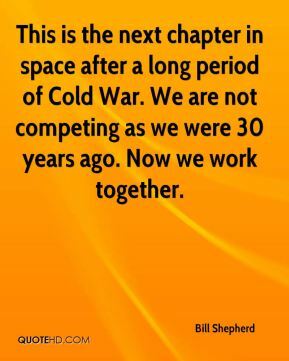 We are not competing as we were 30 years ago. Now we work together. 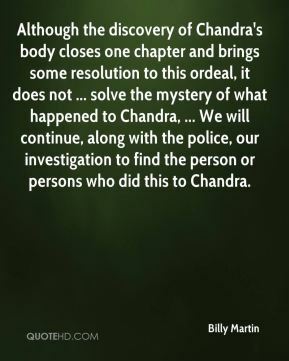 Although the discovery of Chandra's body closes one chapter and brings some resolution to this ordeal, it does not ... solve the mystery of what happened to Chandra, ... We will continue, along with the police, our investigation to find the person or persons who did this to Chandra. 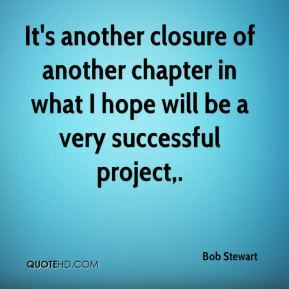 It's another closure of another chapter in what I hope will be a very successful project. We currently have 17 members who are considered to be active. 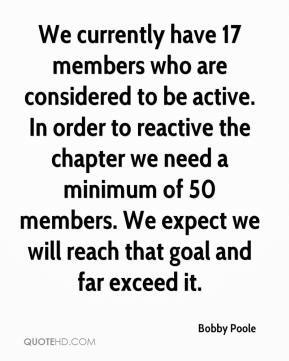 In order to reactive the chapter we need a minimum of 50 members. We expect we will reach that goal and far exceed it. It's a fun process to watch because we know how the final chapter ends. 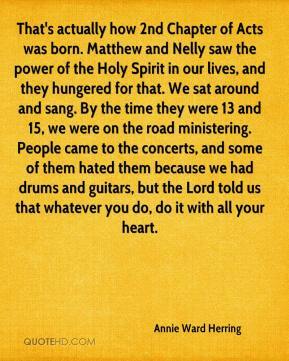 It's fun to watch people go through that self-realization that they can do this. This can't go on any longer. 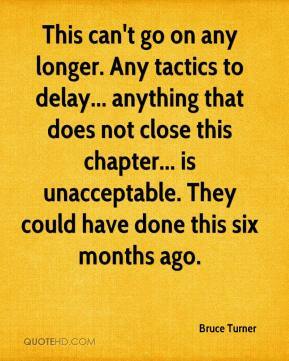 Any tactics to delay... anything that does not close this chapter... is unacceptable. They could have done this six months ago. The local alumni started working with us to make plans for the chapter coming back. We were also in communication with staff at the fraternity's headquarters based in Illinois. 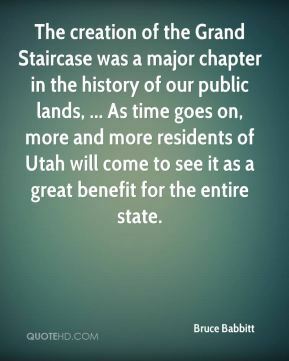 The creation of the Grand Staircase was a major chapter in the history of our public lands, ... As time goes on, more and more residents of Utah will come to see it as a great benefit for the entire state. I just stressed my work ethic and involvement with my chapter and campus, ... 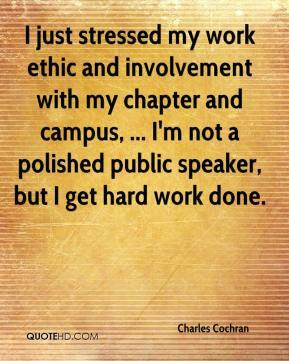 I'm not a polished public speaker, but I get hard work done. 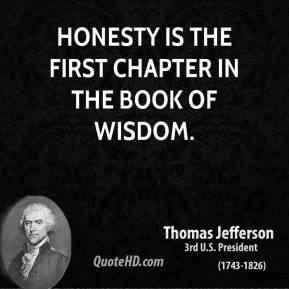 Today is the first day of the last chapter of my life, ... 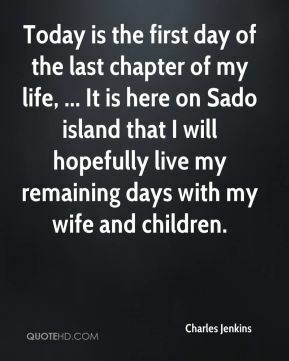 It is here on Sado island that I will hopefully live my remaining days with my wife and children. 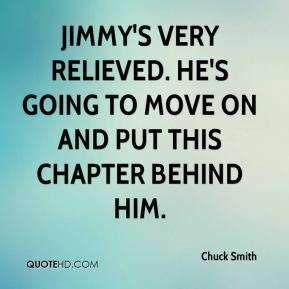 Jimmy's very relieved. 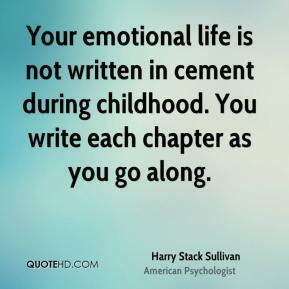 He's going to move on and put this chapter behind him.